Here’s the thing about gratitude: It’s a catch-all feel-good. When you thank someone for something you appreciate, you both feel better. A little while back, when I was having a harried day and had to run to the pharmacy for another sick child, I ran into an elderly man that I recognized from my college days. I said hello to him, but for some reason I felt a flood of gratitude when I got back in my van as I realized what an important role he had played in my life. (He was my mission-prep teacher at BYU, plus the Stake president that set me apart for my mission.) I went home and wrote him a thank-you letter to tell him how much I appreciated all he had done during a very developmental time in my life and in my testimony. I can’t tell you how good it made me feel to write that. I just mulled over and over the blessings that the Lord has given me. I really have no idea how he felt when he got it, but I’m sure he’s been secretly trying to hunt me down since then to thank me profusely for my life-changing note. Or something. Anyway, thank-you notes rock. Beloved blog friend Melanie Jacobson just published her second novel, Not My Type. In her own words, the genre is “LDS chick lit,” so it’s full of romantic tension, characters that are both hip and righteous, and very fun, sassy banter in the dialogue. The cool thing about the book is how the theme of gratitude is woven throughout the main character’s conflict resolution. Pepper Spicer (cute name, huh?) is extremely discouraged about her young adult life– embarrassing romantic failure, living with her parents, working at a sandwich shop instead of living out her career dreams — in short, not at all what she’d wished for. Her current circumstances leave her flitting between depression and bitterness. Her wise father challenges her to take some steps toward a happier life, and a key element of his advice is writing thank-you notes. She scoffs at the naivete of his solution, but agrees to give it a shot. It’s fun to see how her life changes as she learns to embrace the good in her past and her present. And since it’s LDS chick lit, of course this solution also involves a handsome, witty man. 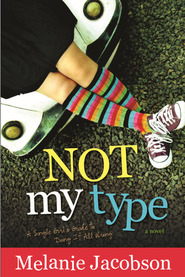 So if you’re looking for a fun read that lets you relive the exciting upheaval of your young adult dating years (without the terrible accompanying emotional pain), you need to get a copy of Not My Type for yourself. Can I help you out a little with that? On Saturday, September 22nd at the Barnes & Noble in Murray, Utah, Melanie is having a book release party along with several other talented authors. More info below*. Anyway, I’m going to go. And I’m going to buy one of you a copy of her book. Here’s the catch. You have to write a thank you note to someone. Go do it right now. It can be an email or snail mail– I’m not picky. It does, however, have to be sincere; maybe think of someone who could really benefit from your gratitude. When you’re done, come back here and report in the comments. Anyone who does so will be entered in a drawing to win a copy of Not My Type, which I will purchase and get Melanie her majesty to sign in person, with a love note to you. Okay, everyone, as you were. After you write a thank-you note or buy a book. Okay, I’m done.